You can decide for yourself if a triple play bundle is a good option for you. If you already have triple play services, you might want to make some changes that will save you a lot of money. 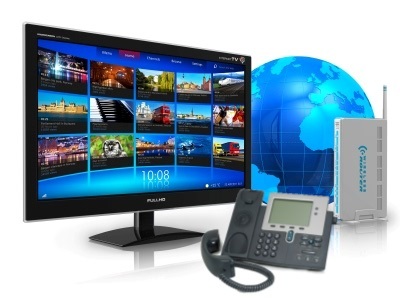 We would love to hear what type of TV, Internet and Phone package or services you have, and if you are happy with it. Please take a few seconds and add a comment or let us know if you have any questions and we will be glad to answer. The Triple Play Market in the U.S.A.
To help evaluate where the residential market currently is and where it is headed, we took a look at the 2012 financial reports of some public companies that offer TV, Internet and Phone bundles. Please note that although both DirectTV and Dish network offer triple play bundles, we have excluded them from this discussion as these companies typically partner with phone and Internet providers to bundle the services along with their own TV service. The following data is taken directly from SEC filing 10-K forms and is for residential services only. Note: N/A = Numbers not Available in Financial report or not broken out enough to be meaningful. Not every company makes a clear distinction on subscribers and revenues associated with a particular service, making it difficult to ascertain growth in some cases. AT&T was the only company that specifically stated a number for the actual reduction in traditional land-lines primarily due to users switching to alternative services such as wireless and VoIP.. Other companies stated this as a challenge and mentioned the competitive pressures from other services. Verizon did not make the distinction between traditional voice and digital FiOS voice. The 10-K states that subscriptions were down due to competition and technology substitutions. Time Warner was the only company that specifically stated a number for triple play subscriber growth. For 2012, this was an increase of 11.90%. Vonage does not offer video or Internet service. We added it to the table as it is a public company offering residential voice service. So while we consider Vonage to be a comparatively expensive option, there is no way for it to hide its voice pricing in a bundled package. The overall growth in Video, Internet and Voice subscriptions and revenues indicates that, in general, companies are benefiting from the digital era and have mitigated the steady transition from traditional voice to packet switched voice services. As triple play (or even double play) numbers are not called out specifically in most cases, it is not conclusive to state that the relatively healthy growth of voice subscriptions is due to bundling of services. It is however, extremely likely that this is the case. It is clear that some people prefer to bundle their voice service with video and Internet access in a single package. Or perhaps they are simply unaware of how much it is actually costing them to take this approach. So what does all this mean and why did we dig into these 10-K reports to get this information? Well, we know for a fact that these companies charge prices for voice services that are much higher than stand-alone voice service providers such as Phone Power and VoIPo, so we wanted to evaluate the growth and determine the volume of people that were in fact signing up for a voice package with a cable or telecom company. Please be aware that every triple play type package uses VoIP technology for the voice service. We actually think these results are stunning and had expected to see a reduction in demand for bundled packages that included voice, as the alternatives are so much cheaper and have many more features. If you don't believe us, then keep reading. When you try to compare different triple play bundles, it starts to get confusing as it is very difficult to compare apples to apples. First of all, you need to identify which companies actually offer service in your area as that will immediately reduce your options to just a few choices. As we are primarily interested in voice service costs we will eliminate video and Internet from this comparison, while still evaluating what type of discounts are typically available for bundling voice with these other services. This is not stated clearly in most cases so we have taken the triple play price and subtracted the double play (TV + Internet) price to estimate the bundled discount for voice, if it is not specifically stated. NOTE: All Voice Service plans include unlimited minutes (local and long distance). In summary, if you bundle TV, Internet and phone services into a single package with one provider, you are highly likely to get some form of discount. In most cases you will be required to agree to a 12 or 24 month contract to qualify for this discount. The providers appear to make it confusing and unclear as to what packages qualify for what discounts. As such, it is often best to simply give them a call and request a discount. You will likely be surprised to find out that they are mainly interested in getting you to agree to another 1 or 2 year term and will give you a discount for both double and triple play packages. There are definitely some pro's and con's to bundling your voice service in a triple play package such as having only one bill to deal with. Alternatively, going with a different voice provider and sticking with only the double play (TV + Internet) package from your cable or telecom company, could save you a lot of money and give you access to a lot more features such as included international calling minutes. The following table makes a comparison of the benefits and features of each of these approaches and specifically looks at how a stand-alone VoIP service compares to a bundled VoIP service in a triple play package. Remember that triple play voice uses VoIP technology so it is, in effect, an identical service to a stand-alone voice service offered by a VoIP provider. The bottom line to all this analysis results in what could be considered to be a fairly straightforward decision. You are cost conscious and want to save anywhere from $15 to $30 per month when compared to a bundled service. You only want to deal with one company, want one bill and one customer service. You are not concerned with additional costs and lack of features. In summary, it is easy to be sucked in by your existing cable or telecom company and be incentivized to include your voice service in some form of bundled package. However, regardless of the incentives that are being offered, it is extremely likely that taking this route will cost you a lot more longer term, as opposed to switching to a stand-alone VoIP service offered by a company such as Phone Power, VoIPo or ITP. After all, it is hard to argue with promotional deals that cost around $6 per month and typically include over 40 features. In answer to the original question "Is a triple play bundled package that includes voice a good deal or not", in our opinion, the answer is clearly NO, and we recommend that you stick with a standalone voice service. I prefer the stand alone VOIP service. Currently I have 2 VoIP services, both are excellent. I pay by the year, which is a great savings versus a monthly rate. I am not very satisfied with my triple play monthly cost with Comcast. They will not allow me to purchase my own modem and therefore I have to keep paying a $7.00 monthly fee with the additional taxes this creates on my bill. I do not use long distance hardly ever. If there is a less expensive way to have all three I would love to hear about it. -> Response: Mary my recommendation is as follows and I know it works because I did this at home. Just get a double play package (TV + Internet). For phone service use a third party VoIP service such as one you will see on our site - see the residential tab at the top of this page. On the modem side, if you do not use Comcast's phone service you do not need their modem. Buy a compatible modem. I used the Motorola SurfBoard SB6121, DOCSIS3.0 and it works great. This will remove the modem monthly fee from your bill and the VoIP service will save you another $20 per month. Hope this helps.